 » First Class » You&apos;re currently reading "First Class and Ms McManus – Learning about Clothes!" 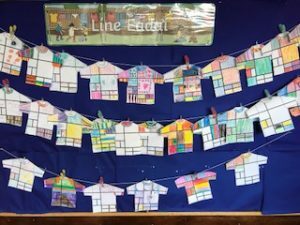 First Class and Ms McManus – Learning about Clothes! This September, First Class have been learning all about clothes. We have even been writing stories about clothes on Fridays! We focused on the different clothes that would be suitable for each of the four seasons. In Spring, we usually wear light clothes sometimes made of cotton, but we usually need a light jumper too. In Summer, we wear shorts, t-shirts and lots of sun cream! In Winter, we like to wrap up in woolly scarves and jumpers. Finally, in Autumn, it is important to keep our raincoats close by, especially in Ireland! We spent some time in Science testing which materials would be best during a rainy Autumn, by checking if they were waterproof. We found that plastic, tinfoil, and rubber were the best materials for keeping water at bay! In art, we designed our own tshirts and hung them up. Check out our líne éadaí! Junior Infants and Ms Walsh Getting Creative for Autumn	September News from Ms. Olson’s Class!